The perfect way to improve on your baseball/softball swing! It might sound strange, but you can get all the batting practice you need without a pitcher! From curveballs, sliders, fastballs, and changeups...our Pitcher Trainer throws them all! Our batting trainer is just like having a portable batting cage or pitching machine. You can use it just about anywhere! 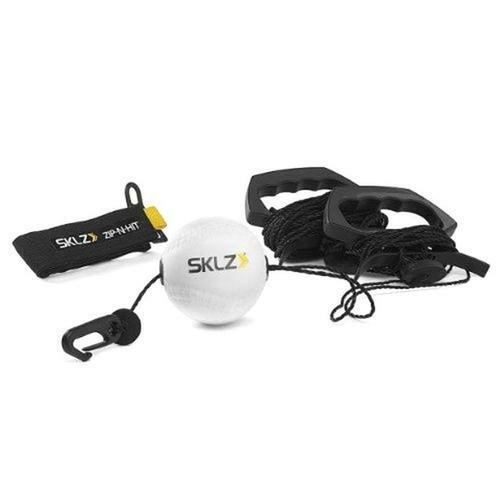 Not only does the Softball/Baseball Pitch Trainer help you develop your swing but it's also a lot of fun to use! OUR TOOL THROWS PERFECT PITCHES EVERY TIME! You'll always get a perfect pitch with our trainer. Practice like a professional ball player and improve on all of your swing styles. Simply pull cords apart to "zip" the pitch to the batter. ****You'll love how the trainer makes you feel like you're working with a batting cage! The long line rope system is easy to use! Simply, pull the cord apart the pitch down the line. You can either attach it to a stable post, chain link fence, or tree with the attachment clip and strap, or you can use a teammate or coach to “pitch” to you.